Bar: Continuous from lunch until closing. Valet: 11am-11pm Mon.-Fri. and 5-11pm Sat. $15 per car. Cars parked with valet at lunch and retrieved after 5pm are charged an additional $15. 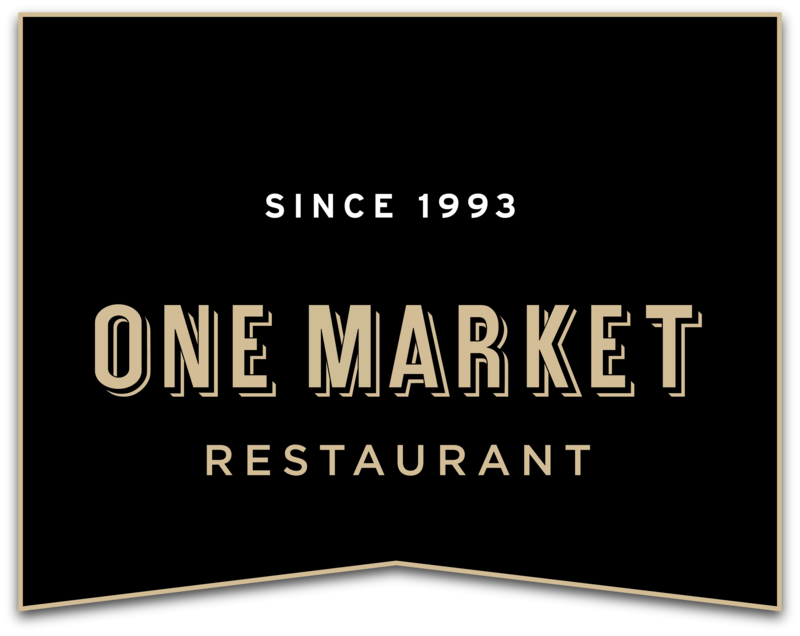 Located at the foot of Market Street (the real “Main Street” of San Francisco,) One Market Restaurant is one block east of the Embarcadero BART station, across the street from the terminus of the California Street Cable Car line and several MUNI bus stops. The restaurant is just across the Embarcadero from the Ferry Building, making connections via ferry to Alameda, Larkspur, Sausalito and Vallejo a snap. From the Golden Gate Bridge, take the Downtown/Lombard St. exit. Turn right onto Van Ness, left on Bush. Bush will end at Battery. Right onto Battery, immediate left onto Market St. Follow Market until it ends at Steuart. Turn right onto Steuart. The Valet is located on the corner of Market and Steuart. Cross the Bay Bridge (I-80 West) and take the first San Francisco exit (Fremont St.). Follow the off-ramp onto Fremont and follow to Market St. Right onto Market St. follow Market until it ends at Steuart St. The restaurant is on your right hand side. Turn right onto Steuart. The Valet is located on the corner of Market and Steuart. From 101 North, take 280 toward the Port of San Francisco to end of freeway (King street), left on Third, right on Market. Take Market to the end. For valet parking make the right onto Steuart Street. The Valet is located on the corner of Market and Steuart. Click here to connect to Google maps. Valet: 11am-11pm Mon.-Fri. and 5pm-11pm Sat. $15 at lunch and dinner, complimentary Friday and Saturday with dinner reservation and receipt. Corkage: $25 first bottle, $5 additional per extra bottle, $40 maximum bottle charge. One corkage fee waived for each bottle purchased.